Martialia hyadesi was originally described from a single specimen in 1882 and redescribed in 1990 (Rodhouse and Yearman, 1990). 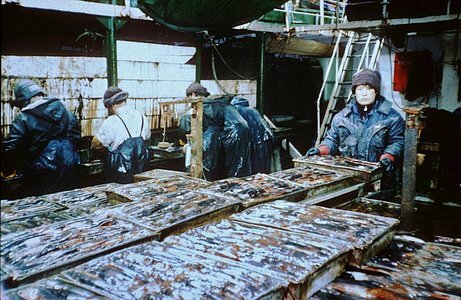 By 1986, twenty thousand tons of M. hyadesi were taken as bycatch in the Illex argentinus fishery. M. hyadesi is a moderate-sized ommastrephid reaching a maximum size of at least 319 mm ML. The specific name of M. hyadesi presumably reflects that of the ship's surgeon on Charcot's ship the POUQUOIS PAS whose name was Hyades and whose ability to cure mal de mer was revered. Figure. Dorsal and ventral views of M. hyadesi. Drawings from Rodhouse and Yeatman (1990). The original description can be found here. tentacular club extending nearly to base of tentacle and not expanded. well developed trabeculae associated with reduced protective membranes on arms and tentacles. Arms with poorly developed protective membranes but large and prominent trabeculae. Right arm IV hectocotylized; left arm IV slightly modified. 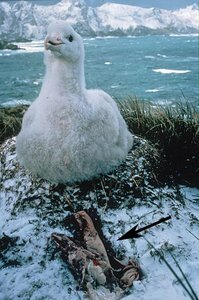 Distal third of right arm IV with small suckers on long stalks; on ventral side, trabeculae form rounded flaps; on dorsal side trabeculae without free ends (free ends of trabeculae gradually diminish in size over proximal two thirds of arm until trabeculae present only as rounded bases to suckers). Suckers of distal third of left arm IV sometimes with elongated stalks. Figure. Oral view of arms IV of a male M. hyadesi showing the hectocotylized right arm and the dentition of one sucker. Hectocotylus = 105 mm. Drawings from Rodhouse and Yeatman (1990). Figure. Oral view of the hectocotylized right arm of M. hyadesi. Drawing from Roeleveld (1988) shows some differences with the previous drawing. 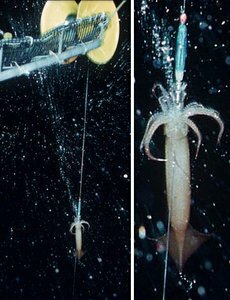 Tentacles much like enlarged arms; most of tentacle occupied by club. Tentacular club not expanded (round in cross-section); not clearly differentiated into carpus, manus and dactylus. Protective membrane poorly developed; trabeculae strongly developed. Tentacular stalks with 3-5 free trabeculae proximal to first suckers on each margin. Figure. 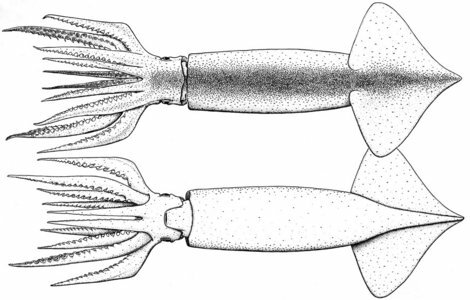 Oral views of the right arms and tentacle of M. hyadesi, female, arm IV = 110 mm. Drawing from Rodhouse and Yeatman (1990). More details of the description of M. hyadesi can be found here. Beaks and soft parts from the regurgitations and gut contents of wandering (Diomedea exulans), grey-headed (Diomedea chrysostoma) and black-browed (Diomedea melanophris) albatross chicks from Bird Island, South Georgia, indicate that M. hyadesi is an important component of the cephalopod diet of these birds and that it is ecologically important in the sub-Antarctic waters of the south Atlantic (Rodhouse, 1990). 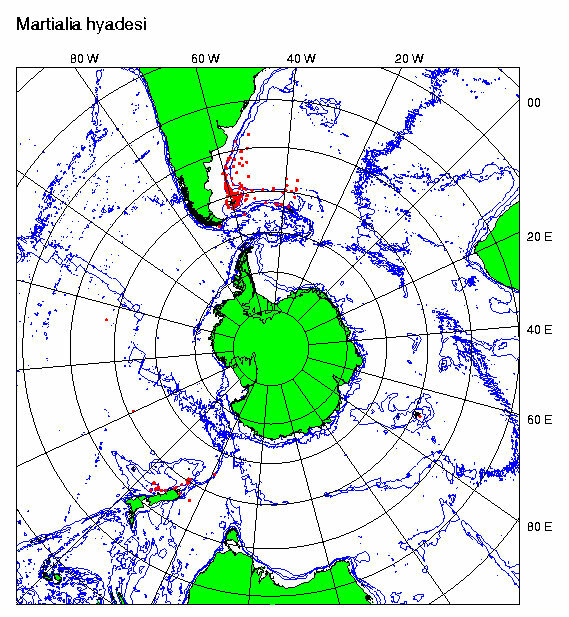 Because of the abundance of M. hyadesi, commercial fishing trials have been carried out in the vicinity of South Georgia, and 8 tons of squid were caught at the Antarctic Polar Front (Rodhouse, 1990). Type locality: Cook Bay, Cape Horn. The holotype is in poor condition and deposited in the Museum Nationale d'Histoire Naturelle, Paris. A map of the distribution of M. hyadesi can be found here. Rodhouse, P. G. and J. Yeatman. 1990. Redescription of Martialia hyadesi Rochebrune and Mabille, 1889 (Mollusca: Cephalopoda) from the Southern ocean.Bull. Br. Mus. nat. Hist (Zool. ), 56(2): 135-143. Page: Tree of Life Martialia Rochebrune & Mabile 1889. Martialia hyadesi Rochebrune & Mabile 1889. Authored by Paul G. K. Rodhouse, Richard E. Young, and Michael Vecchione. The TEXT of this page is licensed under the Creative Commons Attribution-NonCommercial License - Version 3.0. Note that images and other media featured on this page are each governed by their own license, and they may or may not be available for reuse. Click on an image or a media link to access the media data window, which provides the relevant licensing information. For the general terms and conditions of ToL material reuse and redistribution, please see the Tree of Life Copyright Policies.